Drafts, the hugely popular iOS app for making quick text bits and notes, and then repurposing them in all kinds of ways, hit version 3.0 on Wednesday. The new version adds better organization options for drafts and actions, new action options, Reminders integration, and more. 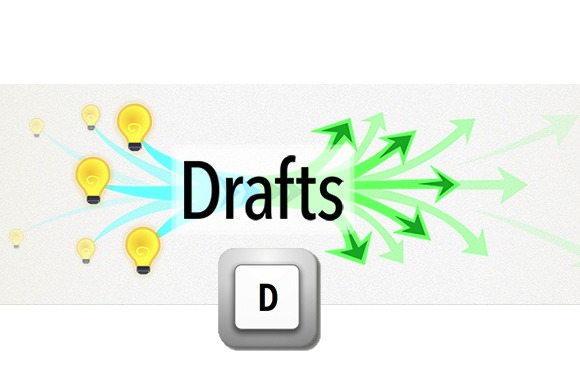 At its core, Drafts ( ) is focused on launching quickly and letting you instantly tap out notes on your iPad or iPhone. The drafts you create are saved automatically, but the real appeal of the app is that you can then act on your text or send it to other apps. Developer Agile Tortoise has been regularly adding all sorts of actions: Whereas the initial version of the app offered just a few, Drafts 3.0 packs in dozens. For example, you can publish drafts to Twitter, App.net, or Facebook; turn them into calendar entries (including optional Fantastical connectivity); save them as Reminders; send them to Evernote; push them to Dropbox; and plenty more. The new organization options let you split actions into tabbed groups for easier access. In fact, the Drafts actions list has grown so long that for some people, the most welcome feature in Drafts 3.0 is a new option for organizing actions. In the Manage Actions section of the app’s settings, you can now organize actions into four tabs (labeled |, ||, |||, and ||||); you also, as always, hide unused actions. Although the organization itself feels a bit clunky—you tap a task, choose which pane it should belong to, and tweak what should happen afterwards—it’s one of those set-it-and-forget-it processes: Once you’ve crafted the perfect action-pane setup for yourself, you never need to revisit that section of the settings. For example, since I don’t use Evernote or Markdown, I hid actions related to those services. (It’s easy to restore hidden actions from the Hidden tab.) I ended up organizing my tabs with the first pane being for sharing drafts on social services, the second for integrations with built-in apps (Messages, Mail, Calendar, Reminders), the third for core iOS actions (Open In, Copy, Print), and the fourth for third-party integrations (Dropbox, Fantastical, and the like). This new organizational takes accessing actions from tedious to awesome. Once you’ve taken the time to sculpt your preferred action organization, you can back up those settings to Dropbox right from within Drafts. Besides giving you the option of restoring things if you muck up your action panes later, this backup feature also makes it easy to sync your action organization between the iPad and iPhone versions of Drafts. You can delete a draft or move it to an archive or pinned folder. The new management options for drafts themselves are also nice. 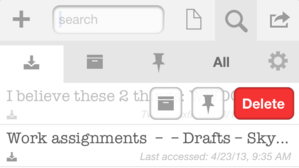 Drafts can live in the main inbox, an archive, or a pinned folder—that last one for those drafts you want frequent, easy access to. Swiping across a draft now offers not just a Delete button, but also buttons for the archive and pinned folders. Among the other new features in Drafts 3.0 is an extended keyboard option: You swipe across the toolbar above the keyboard to expose various special characters. (I found this feature a little finicky—the special keys sometimes seemed to vanish rather quickly.) The email action is now more fully featured: You can add multiple recipients, and you can choose recipients from your device’s contacts. And you can use a special [[clipboard]] variable in action templates you create; this variable automatically pastes the clipboard’s contents when performing the action. 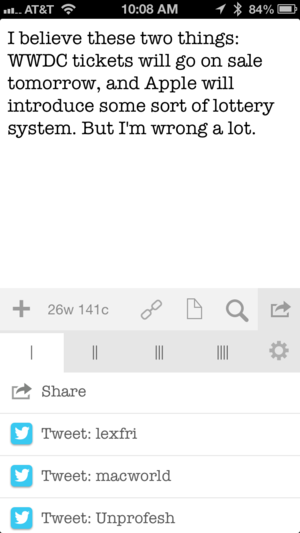 Drafts 3.0 requires iOS 6 or later. The iPhone version costs $3; the iPad version costs $4.